MY name is Carl Washington, I have been rated the best Pet Detective in the US as seen on CNN, FOX TV and many others. For referrals just look up "Carl Washington, Pet Detective" online. For more information use the contacts below. I got my start as a pet detective when a neighbor in Virginia was desperate to find his missing cat. I used a tracking dog to find the cat, and the neighbor insisted on paying for a job well done. childhood, I had found my perfect niche in life. 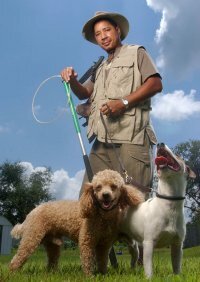 I have the Top pair of tracking dogs in the US, and my online profile services will have your pet back home in 24 hours, call for more information. My two crime-solving partners are a poodle named CoCo and a Jack Russell Terrier named Rocky. 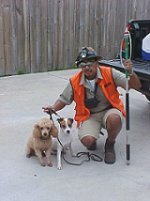 Rocky was trained to listen for the sounds of animals inside of sheds and garages, and CoCo has a keen sense of smell. To see more of this story and many others, click the "Testimonials" link. Call or email for full details. Maps - Find your location, send a map. I WILL MAKE MY SELF AVAILABLE TO ATTEND SPEAKING ENGAGEMENTS FOR YOUR ORGANIZATION. FOR FURTHER INFORMATION IN THIS REGARD. 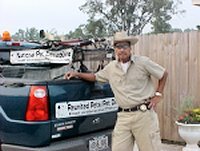 Utilizing available maps of your area, I can provide you with a detailed plan to have most pet's back home in 24 to 48 hrs./ a five page plan and map work detail by me, as to where your pet will show face in the coming hours. *Profiling services consist of an email to customers detailing and utilizing area maps, showing the best possible way of how to find their missing pets.